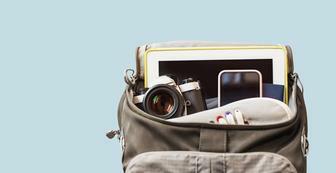 Protect – and prop up – your Apple iPad with the Quirky Cloak - well that's the idea. Should I buy the Quirky Cloak iPad case? In the end, the Cloak has a lot of clever ideas behind it, but it’s just too heavy, and the plastic kickstands feel cheap and somewhat menacing. There are several better iPad folio case options out there. Quirky's $55 Cloak iPad Case is a sturdy, silicone iPad case with a folio-style rigid front cover to protect the iPad’s screen. Inside the cover are two plastic, fold-out kickstands, one for propping up the iPad in portrait mode, the other for landscape mode. The case’s pieces are all held together by a plastic hinge, making the Cloak feel slick and sturdy. Once you tuck the iPad into the Cloak’s silicone lining, you can access all buttons and ports. Unfortunately, that front cover adds a lot of bulk to the case - the Cloak adds 1.2 pounds to your iPad’s weight. The kickstands also feel a bit cheap, and their direct proximity to the iPad’s screen—they sit against the screen when the cover is closed—make me concerned that they might scratch the screen.